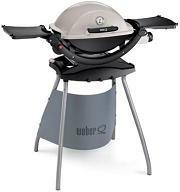 Grill Weber ® Q120 - this is your gas grill that is always with you. Small size and weight of the grill makes it easy to transport in the trunk of the car, and stand-cart, which comes complete turns Q120 an ideal stationary version. 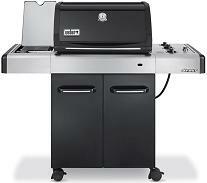 This version of the grill has enough cooking space and power for a small barbecue party. 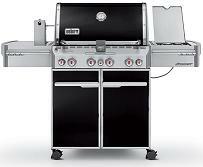 Grill Weber ® Q220 - a combination of high functionality and great design. 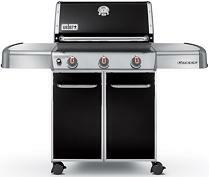 This model has almost the same power and capabilities as the "senior" grills, however, is much more mobile. Relatively small size and weight of the grill makes it easy to transport in the trunk of the car, and stand-cart, which comes complete turns Q220 an ideal stationary version. This version of the grill has a large working surface, rather than Q120 Stand, which means more time cooking! Grill Spirit E-320 Premium - this is the optimum combination of high power, large grid, sufficient work surface and reasonable prices. Three gas burners with independent control, a built-in lid thermometer. In addition, extra burner on the side table, the power of 3,5 kW, will allow you to cook the sauce or soup, along with cooking a steak. Grill is ideal for direct and indirect methods of cooking. Since 2011 a series of Spirit in the new design! Variety of functions, perfect design - this is the essence of the model Genesis. In the grill Genesis E-310 you will find three independent burners, controlled from the front panel plate Favorizer Bars, prevents droplets of fat in an open fire, enameled grill for cooking, which takes care of this "figure" on the grill cooked food. In addition, convenient and reliable electric ignition "run" the grill for a split second. Variety of functions, perfect design - this is the essence of the model Genesis. In the grill Genesis E-330 you will find three independent burners, controlled from the front panel plate Favorizer Bars, prevents droplets of fat in an open fire, enameled grill for cooking, which takes care of this "figure" on the grill cooked food. In addition, convenient and reliable electric ignition "run" the grill for a split second. 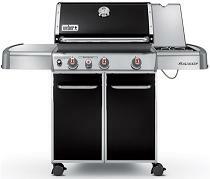 Also, this model is equipped with additional side burner, which you can cook soups or sauces, while working on the grill. Grill Summit ® E-470 is designed for connoisseurs of Weber ® grills with the highest demands for functionality and design. He is a kind of compact outdoor kitchen. Along with four main burners, the owner of the grill can be used on grilled E-470, for example, a small plant for smoking and spit with its own infra-red burner. 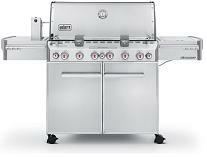 In addition, the grill is equipped with an extra burner Sear Station to create a crispy product. This model - truly a masterpiece. This is the best model for the Weber Grill company's history. This model contains six stainless steel burners, infrared burners, designed to skewer More burner to create a toasted crust on the product Sear Station. Grill is equipped with high-smoking unit, exclusive control knobs with LED-backlit display, and a convenient rotisserie "Tuck-Away".